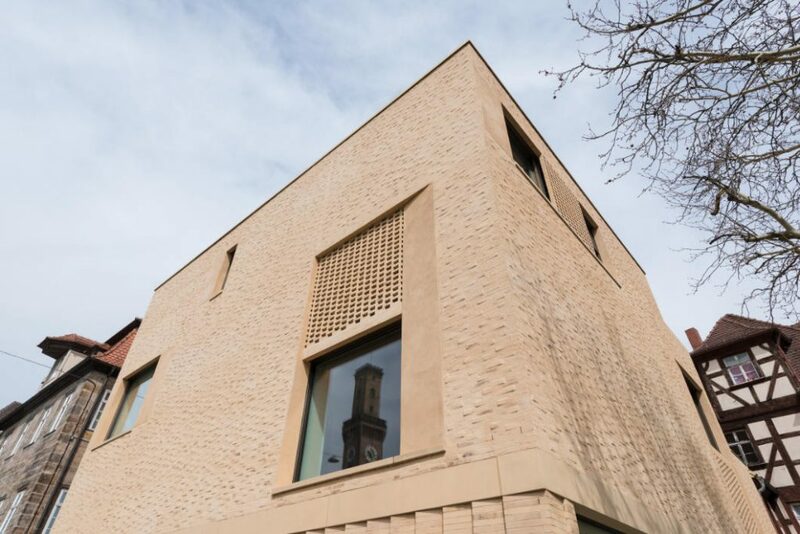 The newly built museum was only opened in 2018 and is located directly next to the old museum building that used to be home to the exhibition. 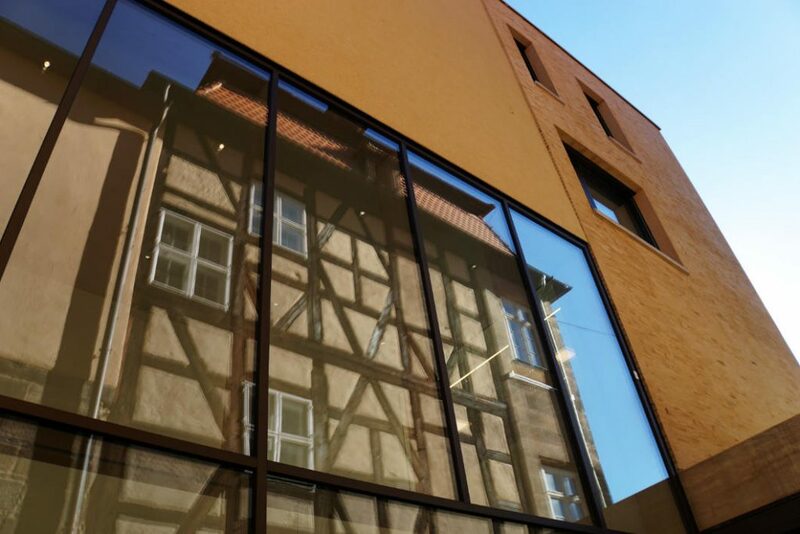 Today, both buildings are used to tell the story of Jewish culture in Franconia. It was Frau Eisenstein who led us through the museum and who took us into another world with her stories and anecdotes. Many thanks! We start by exploring the new building. The modern space is wonderfully open and feels spacious. Light enters the building from all sides and the open layout across multiple storeys strengthens that effect. We find roomy, additional exhibition spaces that are currently showing the temporary exhibition „Cherchez la Femme“. It is an exhibition all about religious headpieces in Judaism, Christianity and Islam. A current topic that is examined without any political agenda. Very interesting! 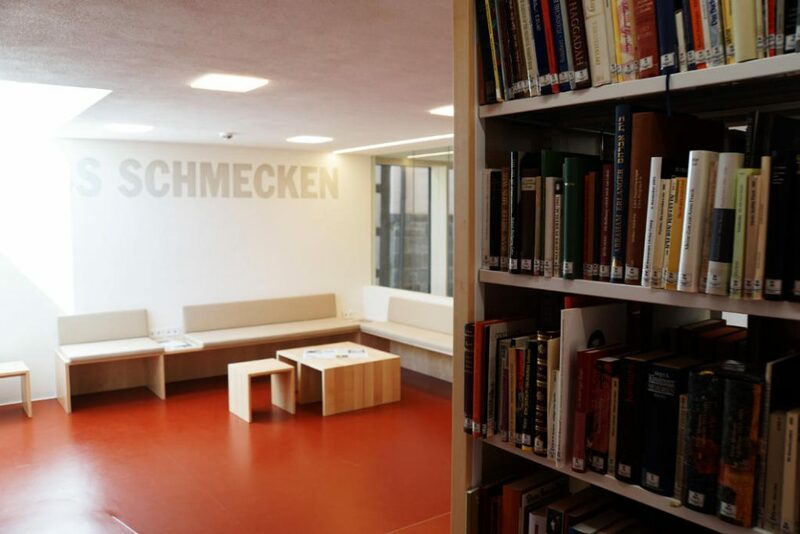 The Krautheimer Library on the top floor of the building is particularly well designed. 12000 pieces on Jewish-Franconian history and culture are available. I imagine that working in this very well lit room is really pleasant. The old building alone is a highlight in itself. The former residential house used to belong to Jewish families from the 17th to the 19th century. The half-timer house is beautifully preserved and has been home to the permanent exhibition since 1999. 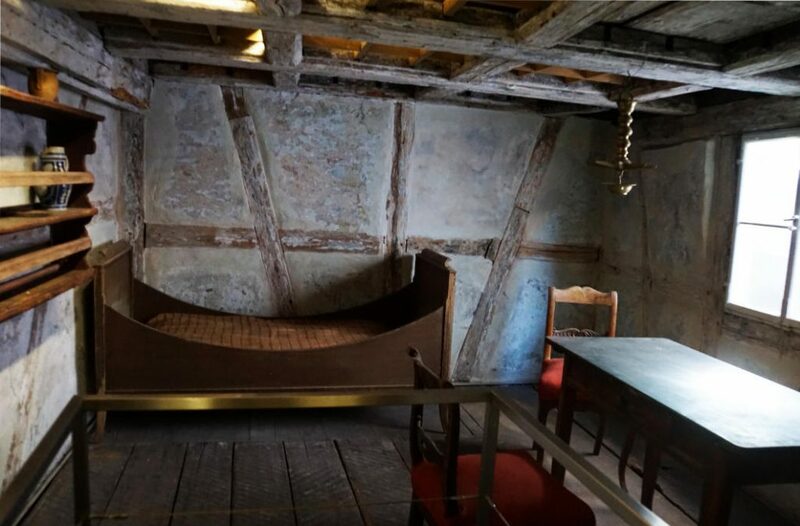 In small, contorted rooms many fascinating exhibits all around Jewish life in Franconia are waiting to be discovered. There are also areas that exclusively cover Jewish life in Fürth. 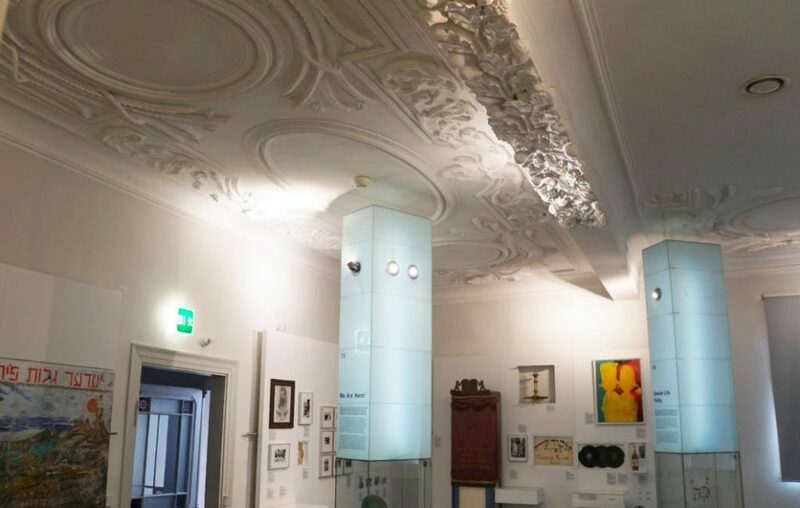 There is extensive information available on the Fürth Central Synagogue, later called Altschul. The entire complex with the central synagogue, multiple other synagogues, Talmudic schools, rabbi houses and mikvah was destroyed in the Night of the Broken Glass (09./10. November 1938) and 300 years of Jewish history in Fürth eradicated. What I particularly liked about the Jewish Museum Frankonia were the mikvah and sukkah. 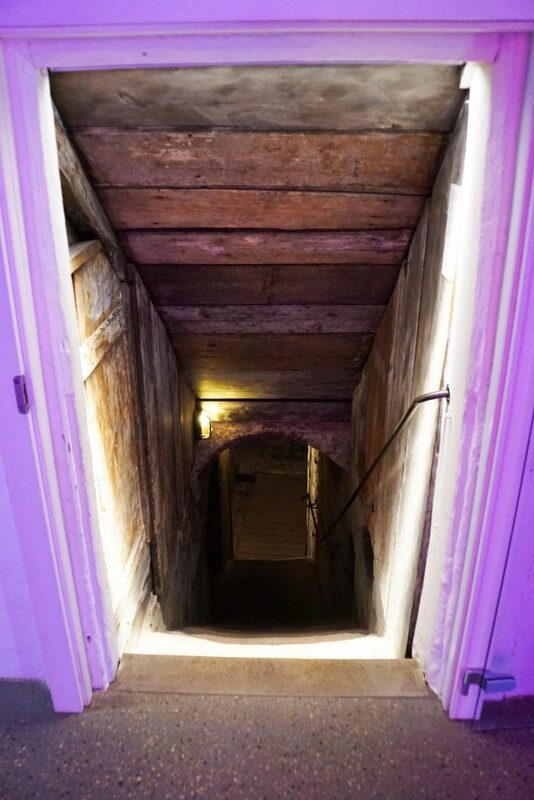 A very special area which is under monument protection is in the basement of the former residential building, the old museum building. 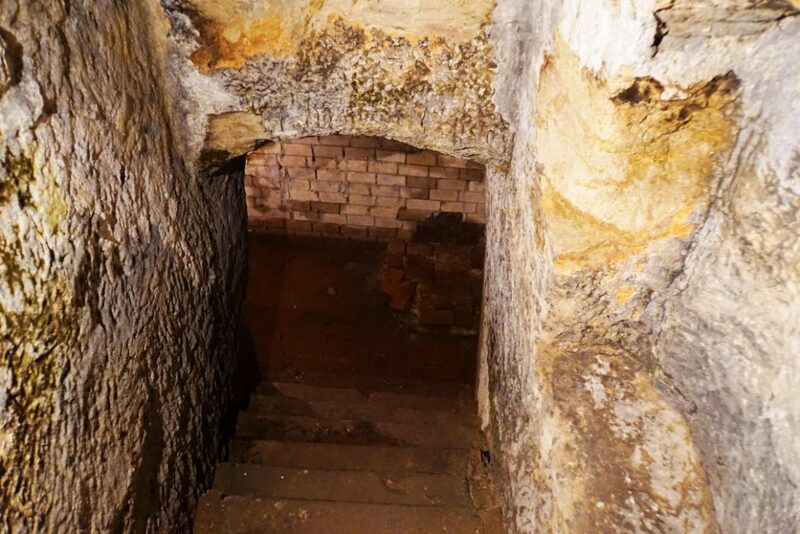 The basement holds a Jewish ritual immersion bath that was presumably constructed around 1600. The bath wasn’t for personal hygiene, it served the purpose of ritual cleansing through immersion. A rule in orthodox and conservative Judaism says that married women have to undergo the ritual bath after giving birth or their menstruation. For men and women who convert to orthodox, conservative or liberal Judaism a ritual immersion bath is mandatory. Also, writers of religious texts have to cleanse their bodies before writing in the Torah scroll. Male, ultra-orthodox Jews use the bath at the beginning of holidays and Sabbath. Then another 7 steps down into the bath. The actual bath is fenced off in the museum so that one can look inside the immersion bath from the side. Another rule says that a bath has to have 500 litres of live water in it. That means that the basin cannot be filled artificially, all water has to be groundwater, rainwater or the like that fills the basin naturally. The mikvah in Fürth, according to the latest examinations, is filled with formation water for example. As I stand here in the dimmed, yet electric light I think about how people used to have these cleansings in candlelight. I believe that this ceremony didn’t only cleanse the body, but the soul as well. Before we came to the Jewish Museum Franconia I had never heard of a sukkah before, to be honest. It was good that we were walking with an expert who was able to provide more insight into that as we proceeded. The Feast of the Tabernacles is a Jewish festival that is celebrated for seven days in autumn. The Feast of the Tabernacles is mentioned in the Torah and it presumably is of a peasant origin. The origin of the Tabernacles probably goes back to shelters on the fields that provided shade during harvest season. Today, religious Jews celebrate the Feast of the Tabernacles wherever the possibility to do so arises. Little huts made from straw, twigs and leaves are built on their own premises. It is important that it is possible to see the night sky from the hut and to sleep outside when the weather is suitable. For those who cannot build a hut themselves, there are other solutions. One of them we were able to see here in the museum. 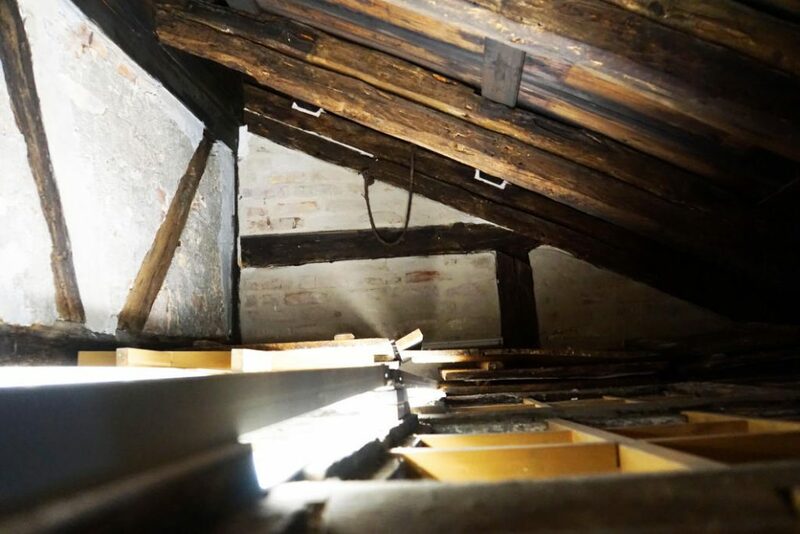 There is no attic underneath the roof of the old building, there is a traditional Tabernacle with a bed and a table. That might not sound like much. But the roof makes it very special. It isn’t one big roof but rather several smaller segments. The segments can be moved to the sides with ropes, like little sliding doors but on the roof. That creates an opening in the roof. There is also a grid fixed to the roof that is covered in leaves for the Feast. This allowed the owner of the house to stay in his own house and to still see the sky from underneath the leaves. I think this must be very nice. Lying in bed and seeing the stars through a roof of leaves. That is certainly already a great experience even without celebrating a religious festival. The visit to the Jewish Museum Franconia was gifted to us as part of a cooperation. The article was created independently and reflects my own personal opinion.